Shady was whelped January 22, 2006; out of NSTRA Ch. Pirate's Bonne Run (Dam) and 4xNSTRA Ch. Tomoka's Mendy Shades (Sire). Shady seems to have inherited many traits from Bonne including her agility, tenacity, and spirit. From Shades, she has acquired excellent speed and range. Shady's nose is also exceptional, leading us to agree with the adage that the whole is greater than the sum of the parts. Shady experienced her first hunting season beginning at 9-months of age. Her enthusiasm and success have led us to believe that January is the perfect time to whelp a litter. Shady found a lot of birds her first season, but we consider that she officially entered into the world of bona fide hunting companions on a trip to hunt chukar in southwest Oregon; rock-solid finds, scaling cliffs for retrieves, and keeping pace with the experienced dogs. 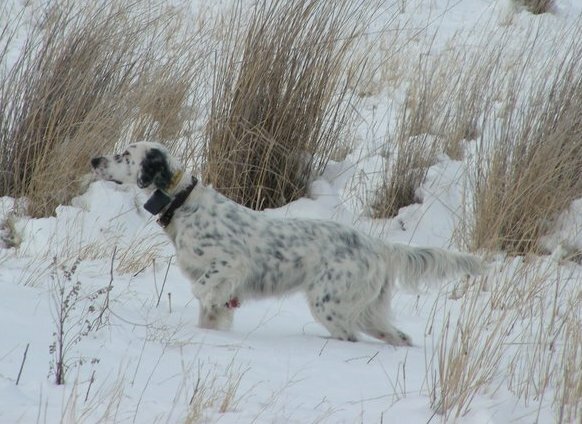 In addition to several trips for chukar, Shady's first year included quail in Arizona and southwest Idaho, and chucker and pheasant in northern Idaho. During fall of 2007, Shady won three amateur trials, and was entered into a few trials in spring of 2008. In fall of 2008 she placed 4 times in three weekends of open trials. And, when hunting season began, Shady really came alive with tenacity and intensity. 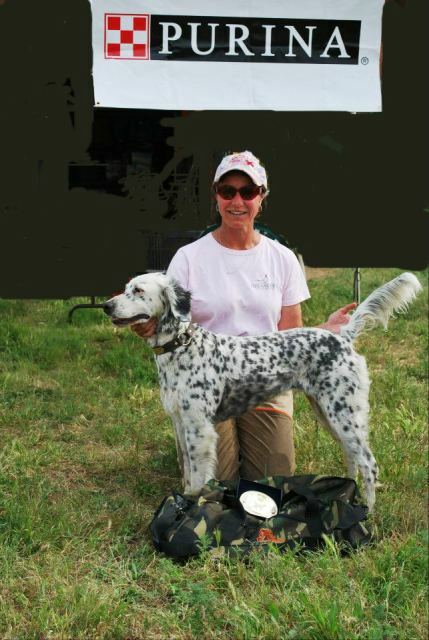 Shady began the 2008-2009 NSTRA season as a two-year old, and competed in her first season in the open class at 31/2 . Her performance was wonderful, qualifying for Regional trials not only in the Northwest, but also in the Big Sky and Northern California-Nevada regions. In all, Shady earned 21 points during the season, earning herself a tie for 34th on the national list of high performance dogs. Her hunting in fall of 2009 was spectacular. She was so solid on her wild birds that we anticipated another terrific trial season. As it turned out, Shady benefitted from some regular "coaching" and work on the “whoa barrel” through the summer. We have been especially pleased with how she has steadied up on released birds. Shady’s work certainly paid off in 2010, as she is now as steady (and every bit a pretty) as are any of the boys. We bred Shady for the first time to Chap’s Jet Setter in February, 2011. We spent a lot of time considering the qualities and blood lines of the sire that would be a promising match with Shady, and we believe we found it. Unfortunately, Shady had a serious complication from a grass seed in her ear, rupturing the eardrum and, we thought, causing the loss of the litter. We bred Shady again in 2012 to our own Tygh, but she again became very ill. After numerous emergency visits to the WSU Veterinary teaching hospital, numerous blood tests and and dozens of pathology reports, we learned that the parasite Toxoplasmosis was responsible for nearly ending Shady's life, and likely both of her litters. The good news; Shady has completely recovered. And, even though Shady only competed in about six braces between fall 2010 and summer 1012, one 4th place finish made her eligible to be drawn for the North West Regional Championship trial in May, 2012, provided that there were an uneven number of dogs eligible with 3rd place or higher finishes. Shady did get drawn, and had a remarkable weekend. She finished 2nd in the elimination trial on Saturday, and on Sunday she completed her NSTRA Championship by finishing as the North West Region NSTRA 2012 RU Champion. Great work for Shady and for her handler, Nance.